Compatible with all Canon EOS cameras with the E3 or N3 accessory connector. Our reader indicate that this mod also works with the Pentax *ist D camera. "Timer Remote Controller TC-80N3 is a remote switch with the following timer control and exposure count control functions. It is very useful for time-lapse photography of blooming flowers, astrophotography, etc." So far, TC-80N3 is unusable on the Digital Rebel due to the proprietary N3 connector; Digital Rebel and other entry-level EOS cameras use the E3 connector. Now you can buy our modified TC-80N3 to use with your EOS E3 cameras. Our modified TC-80N3 has an E3 plug so that it could plug into your E3 camera directly. It also comes with an E3 to N3 adapter, so that you can still use the TC-80N3 with your N3 cameras. A CR2032 3V battery, user manual, and the original package are included. 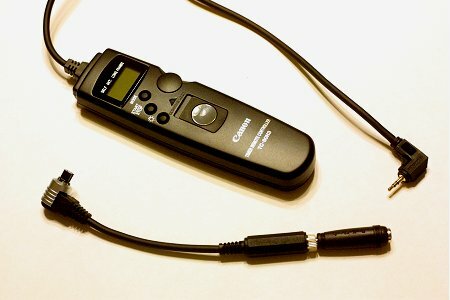 The modified TC-80N3 is also useful if you only have N3 cameras. By utilizing the E3 connector, you can easily extend the remote control using inexpensive cables and adapters from Radio Shack. (See "How to extend the RS60-E3 remote switch?" on this web-site.) No need to shell out for the expensive ET-1000N3 Remote Extension Cord. The modified TC-80N3 is made to order. So it may take up to two weeks for your modified TC-80N3 to arrive. The modified TC-80N3 is void of manufacturer warranties. However, we test each one before shipment. The modified TC-80N3 is only available to U.S. and Canada customers.